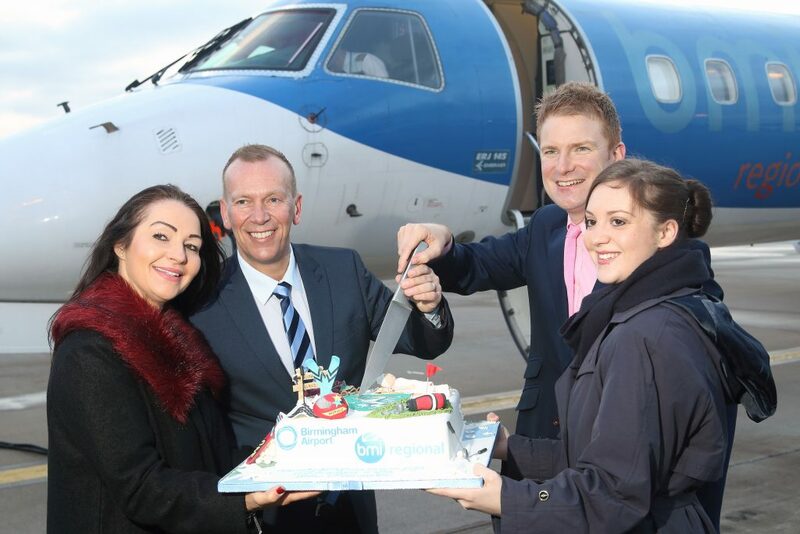 bmi regional has opened its new base at Birmingham with the launch of flights to Graz, Austria. Flight BM1401 operated for the first time on February 27. The service is designed to tap into the strong automotive ties between the two cities, with the schedule built around corporate clients’ requirements. It will initially operate on Mondays and Fridays, rising to four times weekly in March. A single Embraer ERJ will be based at Birmingham with additional routes to Gothenburg and Nuremberg launching on May 8. Schnadt said that despite a short lead-in time to the launch, forward bookings had been encouraging. One passenger who Airliner World spoke to said the new direct flight will save him a minimum of two hours travelling each week; previously he had to route via either Vienna, Munich or Frankfurt. Engine Alliance is celebrating its 500th engine on wing. The manufacturer, a 50/50 joint venture between GE Aviation and Pratt & Whitney, reached the milestone on February 28 when Dubai-based carrier Emirates took delivery of its 90th GP7200-powered Airbus A380. The GP7200, one of two engine options offered for the European superjumbo, now powers 125 A380s, accounting for around 60% of the global fleet. This includes 10 examples each with Air France and Korean Air, eight with Etihad Airways and seven with Qatar Airways in addition to those in service with Emirates. Elsewhere, Engine Alliance has added two new engine overhaul centres to its network: Emirates Engine Maintenance Centre in Dubai and Pratt & Whitney Eagle Services Asia in Singapore. The new facilities will complement the company’s workshops at GE Wales and Air France Industries. 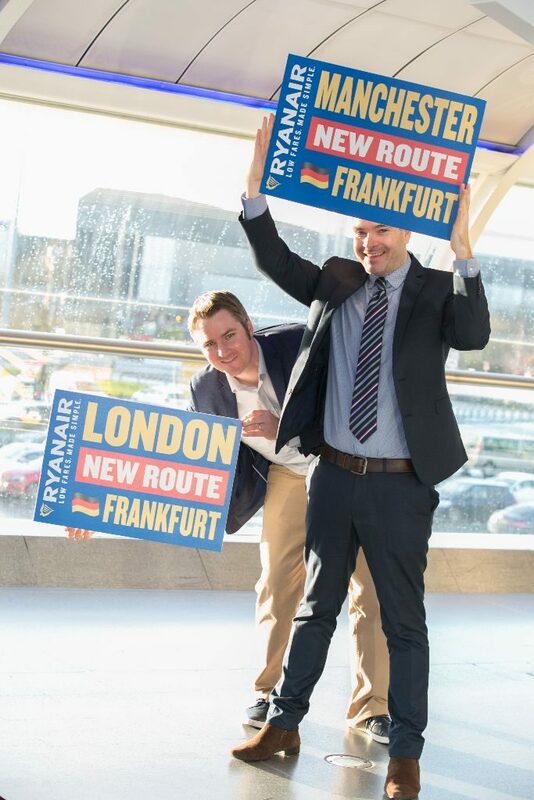 Ryanair has unveiled plans to add direct services from its Frankfurt Airport base to Manchester and London/Stansted. The Irish low-cost carrier’s new German hub, which is due to go online imminently, will initially be linked to four Iberian destinations (Alicante, Malaga, Palma and Faro) with two based aircraft. Its new services to the UK – twice daily to Stansted and six times a week to Manchester – will be added in October to coincide with the introduction of Ryanair’s winter timetable. Stansted’s Aviation Director Mats Sigurdson noted the services will also offer travellers the opportunity to connect onto long-haul services via the German hub. The addition of Frankfurt increases the number of destinations that will be served by Ryanair from Stansted this winter to 124, including new connections to Aalborg, Oradea and Pardubice. The carrier is yet to finalise its Manchester programme. Aerosoft has released Airport Berlin-Tegel “Otto Lilienthal” for X-Plane. The package is compatible with X-Plane 10/11 and offers a very accurate and realistic recreation of the airport with detailed models and textures. Optimized to guarantee detailed graphics and performance, the airport makes for a superb flight destination. Animated ground vehicles, animated radar antennas and hangar doors and fire fighters in action create a lifelike rendition of the airport. Two EA-18G Growler electronic attack aircraft of the Royal Australian Air Force (RAAF) arrived at Avalon, near Melbourne, today, to make the type’s public debut in Australia. The two aircraft arrived to take part in the Australian International Airshow that will take place at Avalon this weekend. A total of four EA-18Gs arrived in country last week when they were delivered to RAAF Base Amberley, Queensland. 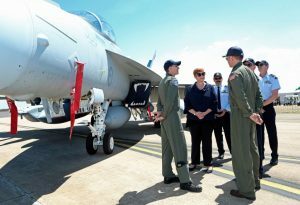 Just months after the last four RAAF F/A-18Fs arrived in Australia in late 2011, Australia voiced interest in acquiring 12 additional Super Hornets and exercising its option to upgrade 12 of the pre-wired F/A-18F+ aircraft into EA-18Gs. Of the original 24 Super Hornets purchased by Australia, the last 12 were built with EA-18G wiring and waveguides installed out to the wing-fold, blanked antenna cut-outs, and structural provisions for equipment racks. A formal request for 12 EA-18G modification kits was announced in May 2012, with plans to convert six Super Hornets into Growlers beginning in 2015, and then to convert the remainder in the early 2020s. 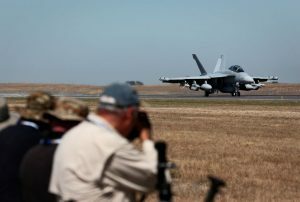 Within a year of that announcement, however, the Australian government changed course and decided to retain its 24 Super Hornets and acquire 12 new-build Growlers. Notification of sale was announced on February 28, 2013, with an estimated cost of $3.7 billion (US). The sale further included AGM-88 High-speed Anti-Radiation Missiles (HARMs) and the new AGM-88E Advanced Anti-Radiation Guided Missile (AARGM). In June 2014, Northrop Grumman began work on the first RAAF Growler’s subassembly, known as a shipset, which includes the center/aft fuselage section, twin vertical tails, and associated subsystems, at the company’s El Segundo, California, facility. In April 2015, the shipset was delivered to Boeing in St Louis for final assembly. The delivery represented the 115th Growler shipset produced by Northrop Grumman and the first for an international customer. The aircraft, numbered A46-301 and designated AG-1, was rolled out on July 29, 2015. Aeroplane Heaven has released the Hawker Typhoon Mk1B for FSX and Prepar3D. Hidden ‘secret’ navigation equipment can be toggled on to provide VOR and ILS guidance, GPS flightplans etc. 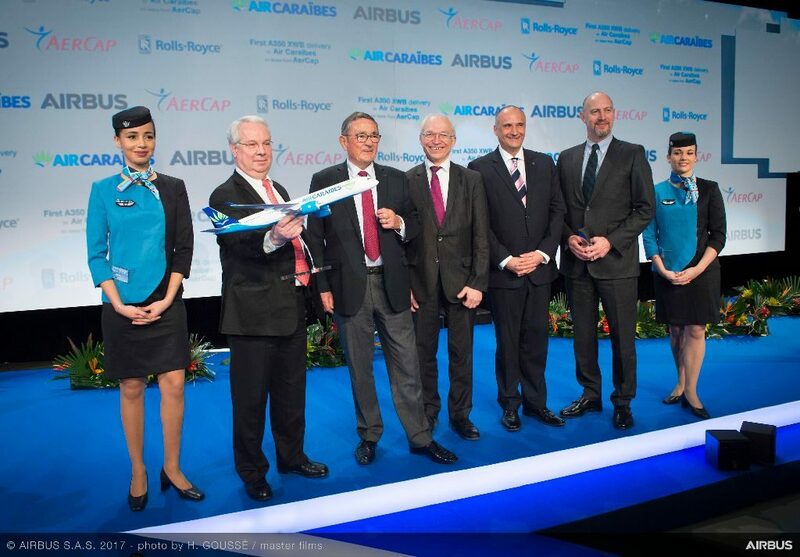 French Caribbean carrier Air Caraïbes has taken delivery of its first Airbus A350 XWB. 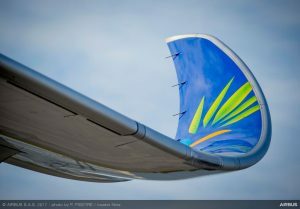 The jet, F-HHAV (c/n 082) – acquired on lease from AerCap – was handed over to the Les Abymes, Guadeloupe-based airline on February 28 during a ceremony at the Airbus Delivery Centre in Toulouse. It was then ferried to Paris/Orly ahead of its maiden commercial service to Pointe-à-Pitre and Fort-de-France on March 2. The aircraft features the European manufacturer’s ‘Airspace by Airbus’ cabin, accommodating 389 passengers in a three-class configuration including 18 in Business, 45 in Premium Economy and 326 in Economy. The defence ministries of the United Kingdom and France have unveiled plans for a mid-life refurbishment of Storm Shadow and SCALP EG conventional cruise missiles. The missile – which first saw combat with the Royal Air Force in Operation Telic in 2003 – is intended to be used in pre-planned attacks against strongly defended, hardened high-value static targets. The refurbishment work will be led by European missile house MBDA and will extend the operational life of the weapons ‘against the anticipated evolving threat’ well into next decade. Following a development phase, the Storm Shadow/SCALP mid-life refurbishment programme will be validated by a series of flight trials in 2019. The first refurbished missiles are due to be returned to service in France and the UK by early 2020. The Franco-British Storm Shadow/SCALP programme was launched in 1996. In British and French service the missiles currently arm Royal Air Force Tornados (Storm Shadow), Armée de l’Air Rafales and Mirage 2000s (SCALP) and Marine Nationale Rafales (SCALP). Integration is currently underway for the Typhoon. In French service, the SCALP EG nomenclature stands for Système de Croisière Autonome à Longue Portée – Emploi Général, or long-range autonomous cruise system, general purpose. To date, almost 3,000 Storm Shadow/SCALP missiles have been delivered or are under order for nine armed forces around the world. Nearly 200 examples of the missile have been deployed during operations since the weapon’s entry into service in 2003. A derivative of the missile, named Black Shaheen, arms the United Arab Emirates’ Mirage 2000-9s. Orbx developer, Jarrad Marshall, has revealed preview screenshots of the upcoming project , Innsbruck Airport (LOWI). He said the package will provide exhaustive coverage of the area (the largest PR area of any ORBX airport to date), many helicopter landing areas, and over 160 detailed landmarks and points of interest. Far beyond the city, explore the peaks of Karwendel, Stubai and Tux Alps, the picturesque Inn, Wipp and Stubai Valleys, a portion of the historic Brenner Pass and even Germany’s tallest mountain, Zugspitze. Over a dozen towns and villages dot the Tyrolian landscape, each carefully reproduced with colour-blended scenery and highly-detailed autogen. Keep an eye out for visual cues useful to pilots of all stripes; animated trains, prominent structures (including notable church spires along the flightpath), custom-modelled bridges, hazardous power lines and notable buildings are all lovingly recreated. I have endeavoured to capture the atmosphere and palette of the beautiful Tyrol region, whilst still spending a huge amount of time on the “small details”. As always, I stress greatly about performance; as such huge efforts have gone into optimising this scenery in anticipation of you flying your favourite resource-heavy airliner – we are currently deep in performance benchmark testing with the team. Whether you are a by-the-book airline captain, bizjet guru, helicopter rescue pilot, casual general aviation flyer or even slow-and-silent glider pilot, ORBX FTX Innsbruck will be the scenery for your simming adventures. Innsbruck Air Rescue Heliport (LOJO) – major helicopter base attached to Innsbruck Airport. Innsbruck University Hospital (LOIU) – the famous rooftop helipad in the city centre. Hat Tux Heliport / Alpin 5 (LOJT) – forward base for alpine rescue operations, located high up in the Tux Alps. Fire Service College Heliport (LOIN) – a fun location, and a little hard to find. Training school for local fire/rescue operators. Emergency Helipad – A nondescript landing area situated adjacent to the railway line near Buch-in-Tirol. US Air Force WC-135C 62-3582 Constant Phoenix was photographed heading out from RAF Mildenhall, Suffolk at 11.50hrs today. The secretive aircraft is equipped with ‘sniffing’ equipment to detect and identify debris from nuclear weapons detonations. The WC-135 arrived at 23.00hrs on Friday, February 17, leading to much speculation as to why the aircraft was deployed to Europe. Some sources suggest the deployment was in reaction to possible nuclear tests by Russia. 62-3582 departed Mildenhall in a north-easterly direction, with support from a pair of Mildenhall-based tankers from the 100th Air Refueling Wing: KC-135Rs 63-8021 61-0321, using the callsigns ‘Quid 524’ and ‘Quid 525’, respectively. Use of two tankers suggests the Constant Phoenix was embarking on a very long mission. Tracking north off the east coast of Scotland. The three aircraft were then sighted on the Virtual Radar Server flying along the east coast of Scotland, now accompanied by another KC-135 and an RC-135W Rivet Joint intelligence-gathering aircraft. RC-135V/W Rivet Joint aircraft perform communications intelligence missions along the frontiers of Vietnam, China, North Korea and Asiatic Russia, as well as in the Baltic and Barents Seas. In early January, reports emerged of a spike in iodine levels in northern Europe. Although iodine can be present in the atmosphere for various reasons, it could be the result of some kind of nuclear incident, perhaps a nuclear test. Two WC-135s are currently in service at Offutt Air Force Base, Nebraska. While the cockpit crew is provided by the 45th Reconnaissance Squadron, special equipment operators are assigned to Det 1, Air Force Technical Applications Center at Offutt. In recent years the WC-135s have been better associated with transits through Kadena Air Base. North Korea’s emergence as a nuclear power has made Constant Phoenix a familiar site at the Japanese base.